doi:10.4236/ojog.2011.14032 Published Online December 2011 (http://www.SciRP.org/journal/ojog/). Department of Gynaecology and Obstet rics, Deventer Ziekenhuis, Devent er, The Netherlands. Received 4 October 2011; revised 22 November 2011; accepted 3 December 2011.
activity inhibition and a prolonged bleeding time. studies found with respect to this important issue. 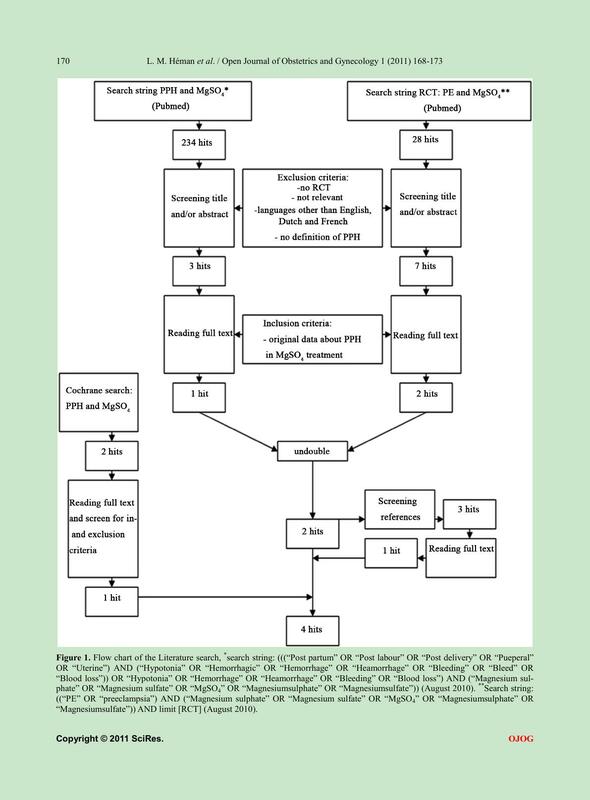 partum Hemorrhage (PPH) during the last decade [1,2]. because of three following effects. more, MgSO4 is effective as an antihypertensive drug. dilatation [5 ]. Vasodilatation could induce PPH . Secondly, MgSO4 can be applied as a tocolytic drug. MgSO4 treat me nt increases the risk of PPH. MgSO4 treatment which gave original data about PPH. given for neonatal neuroprotection before preterm birth. our review (see Figure 1 Fl ow char t). followed and treated during labour. fidence interval of the combined studies. 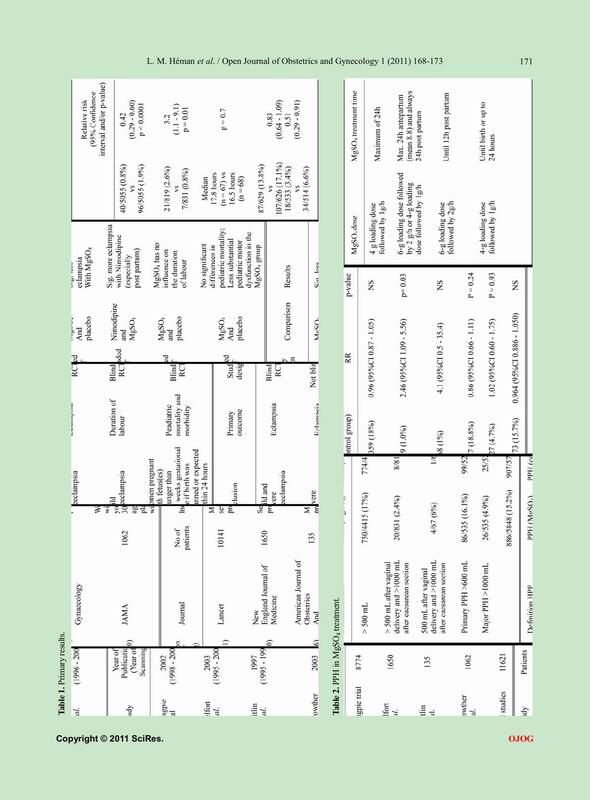 In Table 1 the primary results of the trials are shown. the comparison i.e. placebo or Nimodipine. women when treated with MgSO4. versus placebo (p = 0.036). 0.964 (95%CI 0.886 - 1.050)). increase in PPH in women treated with MgSO4. continued with 1 gram per hour for 24 hours at most. differences in outcomes, and thus the effects of MgSO4. 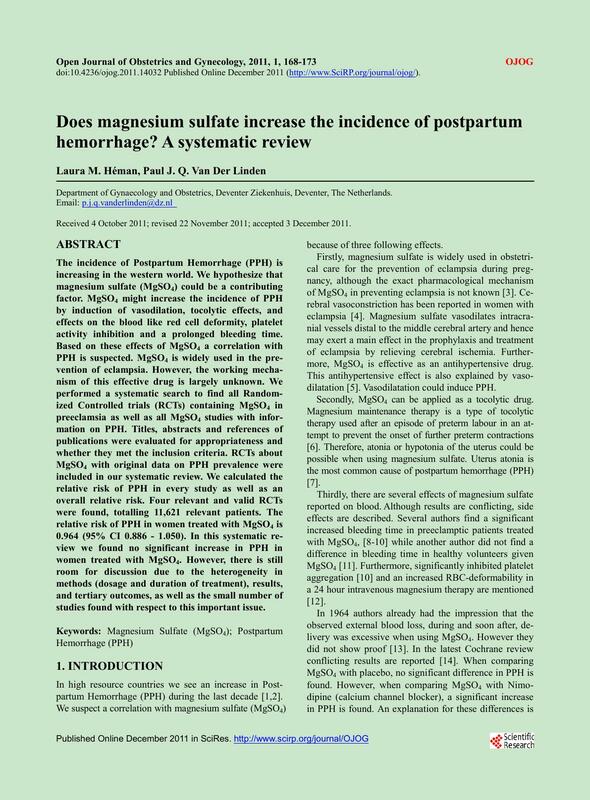 “Magnesiumsulfate”)) AND limit [RCT] (August 2010). Table 2. PPH in MgSO4 treatmen t .
sage of ox ytoci n needed in the MgSO4 gro up (p = 0.036). enha nce t he u se o f M gS O4 and the duration of treatment. gerous and frequent complication of labour . ing time and provoke vasodilatation. is an argument for more and specific research. Pre gnanc y and Childbirth, 9, 55. 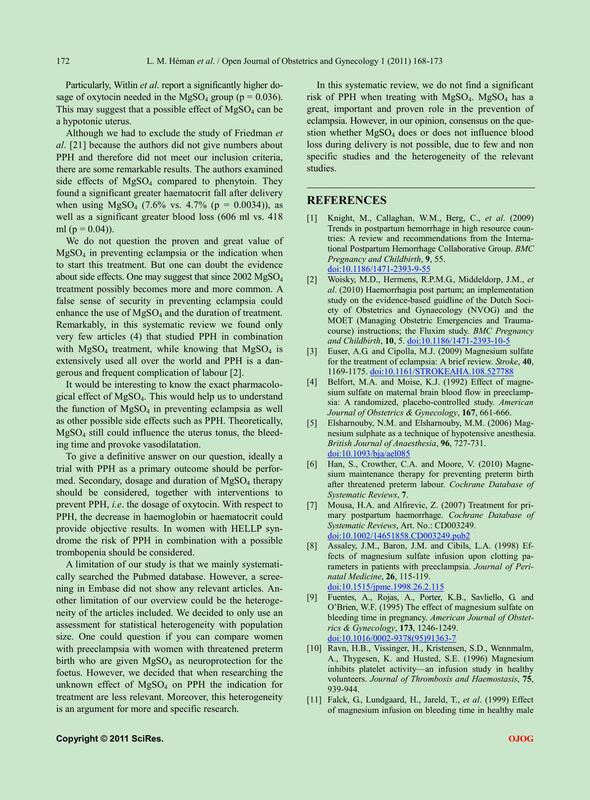 Journal of Obstetrics & Gynecology, 167, 661-666.
nesium sulphate as a technique of hypotensive anesthesia. British Journal of Anaesthesia, 96, 727-731. Systema tic Reviews, Art. No. : CD003249. rics & Gynecolog y, 173, 1246-1249.
tabase of Systemat ic Reviews, Art. No. : CD000025. 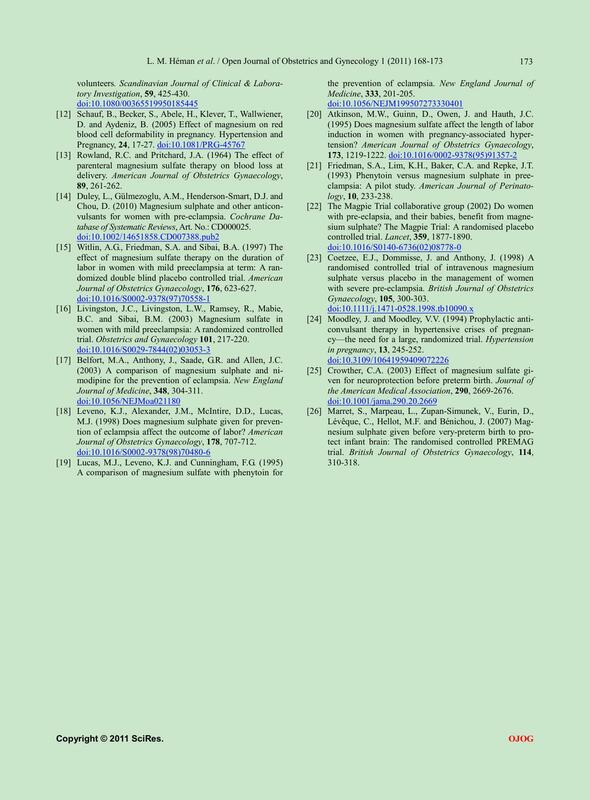 Journal of Obstetrics Gynaecology, 176, 623-627.
trial. Obstetrics and Gynaecology 101, 217-220. Belfort, M.A., Anthony, J., Saade, G.R. and Allen, J.C.
Journal of Medicine, 348, 304-311. Journal of Obstetrics Gynaecology, 178, 707-712. Atkinson, M.W., Guinn, D., Owen, J. and Hauth, J.C.
 Friedman, S.A., Lim, K.H., Baker, C.A. and Repke, J.T. controlled trial. Lancet, 359, 1877-1890.
the American Medical Association, 290, 2669-2676.